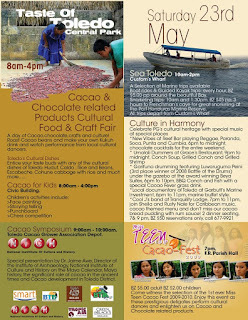 You can't afford to miss this year's Cacao Festival; it will be bigger and better than ever. Remember this weekend will be a long weekend in Belize - Monday 25th is a Holiday "Commonwealth Day"
Is there a flyer for Crooked Tree cashew fest.? There is no flyer for the Cashew Fest. I must say that after seventeen years, CT Cashew Fest is terrible disorganized.